Matto recently published a piece in Scientific American on the legacy of Garrett Hardin for modern environmentalism. As he writes, Hardin’s work was animated by a difficult legacy of discrimination and racism. We need to find new metaphors if we want to build a just and vibrant climate future. 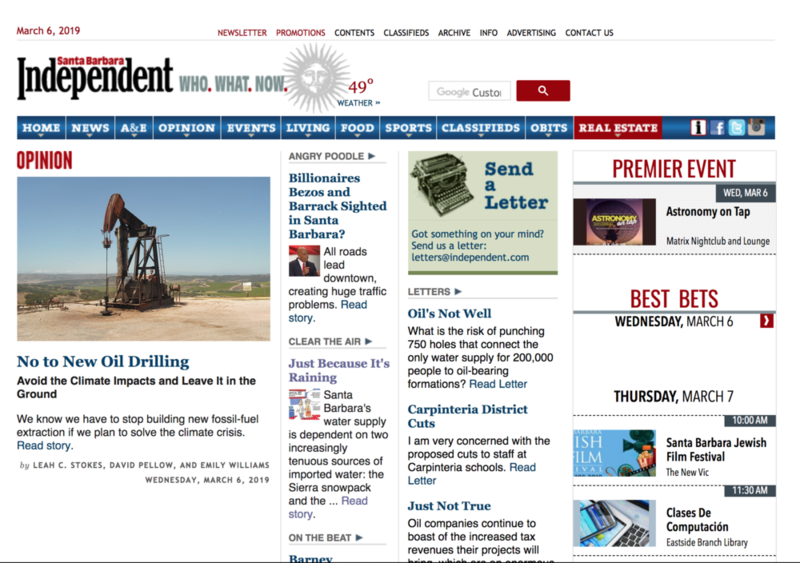 Stokes co-authored an op-ed with David Pellow and Emily Williams in the Santa Barbara Independent on the proposed oil drilling in the north part of the county. 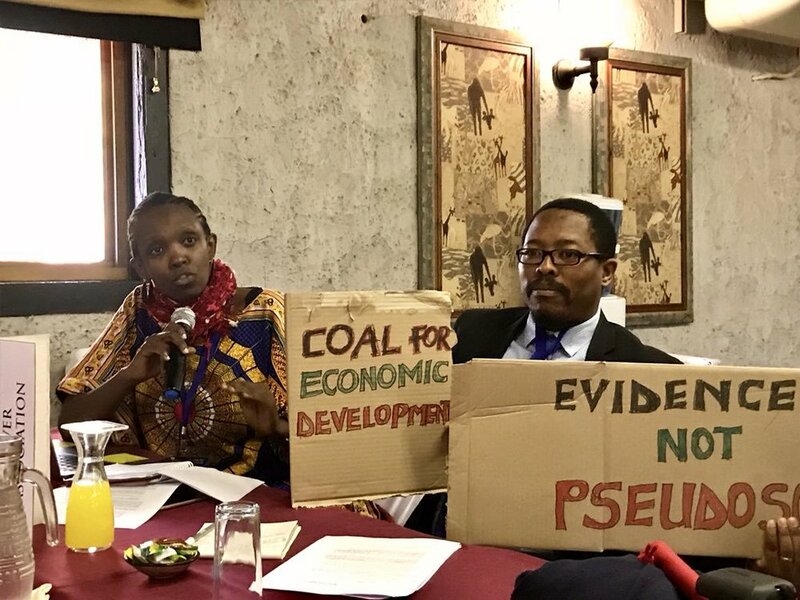 We argued that new fossil fuel infrastructure in problematic for both climate change and environmental justice reasons. Stokes published an opinion piece in the Washington Post on the Green New Deal. Stokes & Mildenberger wrote an opinion article in the New York Times which summarized their article in American Political Science Review (APSR) on legislative staff in Congress. This article, published just before the fall 2019 election, aimed to raise awareness about the gap in representation in Congress. Leah Stokes co-authored an article with Nic Rivers in Maclean’s on Canada’s proposed carbon rebate program. She argues that policy implementation will be important to ensuring that rebates actually shore up support for the climate policy. Updated maps that show the distribution of US climate and energy opinions at the local level have been released. These maps now include fourteen new variables, including perceived experiences related to global warming and support for a carbon tax. Mildenberger is one of the lead researchers preparing and developing these maps through the Yale Project on Climate Change Communication. You can explore these maps for yourself here. The Mercury Game, a free negotiation simulation that Leah Stokes wrote with Noelle Selin and Larry Susskind, continues to be played around the world to train scientists and policymakers alike. Most recently, it was played in June 2018 at the American Association for the Advancement of Science (AAAS) with a group of around 35 scientists from across the world as part of the Science Diplomacy workshop. The game was also played at this workshop in 2017, and Leah Stokes attended both events, helping to teach negotiation skills to these scientists. The game was also recently played as part of a regional workshop on science diplomacy in South Africa, as part of a partnership between the American Association for the Advancement of Science and The World Academy of Sciences. The game has also been recently played as part of training at the Pakistan Foreign Service. The American Association of Public Opinion Research (AAPOR) recently awarded its 2018 Warren J. Mitofsky Innovator's Award to the Yale Project on Climate Change Communication (YPCCC) for its work to model climate and energy opinions at state and local scales. Matto is one of the project leads on this research project, a long-term research effort he has been spearheading for the past 6 years. Matto's climate and energy downscaling work has resulted in a number of high profile publications, coverage on the front page of the NY Times, and extensive attention within advocacy communities. The Warren J. Mitofsky Innovators Award recognizes accomplishments in the fields of public opinion and survey research that occurred in the past ten years or that had their primary impact on the field during the past decade. In the award citation, AAPOR commended the team for its use of a "new statistical method to downscale national public opinion estimates using multiple regression and post stratification (MRP) survey data collection methodology."